Last week, the Greater Miami Jewish Federation and Friends of Yajad-Venezuela launched the Venezuela Support Fund. The two-year, joint campaign is raising humanitarian funds to assist the people of Venezuela and the Jewish community during this time of extreme hardship. Thanks to your generous donations, in only one week, we are more than half-way toward our two-year campaign goal. One hundred percent of all donations to this fund will go directly to programs and services in Venezuela. Click here to make a donation now. 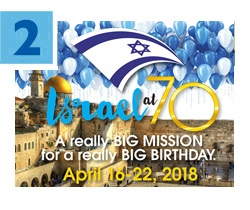 By now, you’ve heard the news: Next year, Federation is celebrating Israel’s 70th birthday with a really big Mission, April 16-22, 2018! In fact, 330 people have already registered. If you still have questions, we invite you to attend one of several upcoming information sessions. These intimate gatherings, hosted by leaders in our Jewish community, are taking place in homes throughout North Dade, South Dade and Miami Beach. To join one of the meetings or learn more about the Mission, contact Abby Mandel at amandel@gmjf.org or 786.866.8436. End-of-life care and conversations are crucial, but few people know how to adequately address such a complicated topic. To discuss this subject, Federation’s Mishkan Miami, Jewish Community Services of South Florida (JCS) and Miami Jewish Health present the 22nd Annual Ministering to the Elderly Conference on Thursday, May 25. Continuing education credits will be available for qualifying participants. Executive Director of The Conversation Project Harriet Warshaw will give the keynote address. Click here for more information and to register. Summer is right around the corner – do you know where your children will be? Enrollment for summer camp at our three Jewish community centers is now open, and filling up fast! The Alper JCC, Michael-Ann Russell JCC and the Miami Beach JCC – offer a variety of programs for children from pre-kindergarten to high school, along with many specialty camps, including swimming, gymnastics, robotics, cooking, sports, performing arts, teen travel, dance and much more. The Annual Federation/UJA Campaign proudly supports the JCCs with funding and scholarship opportunities. Last week, students from three Jewish day schools and members of the Yerucham Science Center participated in the First Annual Miami Jewish Day School Robotics Festival. Supported by a grant from Federation’s Miami-Yerucham Partnership and facilitated by the Center for the Advancement of Jewish Education (CAJE), a group from Yerucham’s award-winning robotics team worked with 3rd- and 4th-grade students from Hebrew Academy (RASG), Lehrman Community Day School and Scheck Hillel Community Day School. Many leaders, teachers and administrators from other schools attended the event and have expressed interest in participating next year. CAJE is a subsidiary agency of Federation.